All Valley High School students are required to complete an Individual Career and Academic Portfolio (ICAP). 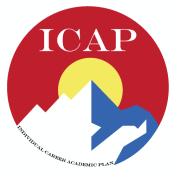 Every student must complete all ten components of the ICAP in order to be eligible for graduation. There are multiple classes offered at VHS that incorporate ICAP requirements into the class curriculum, such as the ACE and Business Careers classes. Additionally, the counselors will work with the students individually and in grade-level groups on completing the ICAP requirements. Every student at VHS has a personal account on College in Colorado (CIC). Using this website, students are able to explore careers, research colleges, learn about scholarships and financial aid, prepare for the ACT and SAT, fill out applications and complete their ICAP requirements. In order for a student's ICAP to be considered complete, all 10 ICAP components must be documented in their CIC account. Some of the components can be completed using the CIC website; others must be completed elsewhere and then the appropriate documentation must be uploaded to each student's CIC account. Please review the ICAP requirements and forms carefully for more information. *Click on the individual requirements for more information.